Sharon Feiman-Nemser, Mandel Professor of Jewish Education at Brandeis, is the Director of the Mandel Center for Studies in Jewish Education. At Michigan State University, where she served on the faculty for twenty years, Sharon co-directed a field-based teacher education program and conducted research on teacher education, new teacher induction and mentoring in the U.S., England and China. Sarah Birkeland, Research Affiliate at The Project on the Next Generation of Teachers at the Harvard Graduate School of Education, is co-author of Finders and Keepers: Helping New Teachers Survive and Thrive in our Schools (Jossey-Bass, 2004), as well as numerous articles about new teachers’ experiences in schools. The induction of beginning teachers and the development of school-level professional learning communities are often treated as separate issues, requiring separate resources and interventions. This may be due, in part, to the tendency of policy makers and practitioners to discuss induction as a formal program for beginning teachers something that can be designed, funded and implemented and to discuss a professional learning community more as a cultural phenomenon. 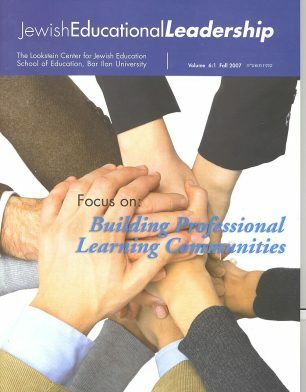 An influential 2005 report by the National Commission on Teaching and Americas Future (NCTAF), entitled “Induction into Learning Communities” develops an idea that has become increasingly apparent in recent years: the two topics are not separate at all; rather, they are deeply connected. At Brandeis University’s Mandel Center for Studies in Jewish Education, a partnership with Jewish day schools focused on new teacher induction provides a vivid reminder of how the two are linked, and how one can lead to another. Current collaborations with four day schools in the Boston area, aimed at building strong, school-based systems of beginning teacher induction, create opportunities for faculty and administrators to develop the understandings and commitments that underpin a true professional learning community. These experiences are helping us understand how a focus on induction, a worthy end in itself, can be an effective vehicle for opening up conversations about professional culture and practices that promote such transformation. If one thinks of beginning teacher induction not only as a program of support and development, but also as a process of introducing novice teachers to a schools prevailing culture, values and practices, the link between beginning teacher induction and professional learning communities becomes apparent. This conceptualization of induction moves beyond the image of a structured set of activities for beginning teachers, and focuses attention on the school as a site for teacher learning, including learning the professional norms of the school and what it means to be a teacher there (Feiman-Nemser, Schwille, Carver and Yusko, 1999). Indeed, researchers from the Project on the Next Generation of Teachers argue that we cannot focus on beginning teacher induction as an isolated initiative; formal structures such as mentoring or new teacher orientation are meaningless unless they occur in supportive professional cultures (Johnson et al, 2004). The recent NCTAF report asks the rhetorical question, “If all schools were truly learning communities, would we even need to talk about mentoring?” (2005, p. 2) Since most schools are not yet true professional learning communities, and many are just now considering how to work towards becoming one, the question is optimistic at best. Perhaps a more productive question is how can a considered focus on beginning teacher induction, and its associated practices (such as mentoring), help move a school towards becoming a true professional learning community? At our Center, a team of educators and researchers is collaborating on a project called the Induction Partnership. We have deployed coaches to help build strong systems of new teacher induction in a group of diverse, local Jewish day schools. Our initial goal for the 2-year coaching project was to help make these schools educative environments in which beginning teachers could thrive, by instituting a system of supports specifically geared towards addressing their needs. As they focus their resources and attention on beginning teacher induction, the schools in our partnership are looking more and more like professional learning communities. The Induction Partnership differs from other beginning teacher induction initiatives in several ways. First, our team entered partnerships with four local Jewish day schools with the notion that induction is both a process of enculturation and a program of support and development, and that its implications are school-wide. We determined to help school leaders institute elements associated with strong induction, such as information-rich hiring, orientation, mentoring, curricular support and transparent teacher evaluation processes (Johnson et al, 2004). Yet we have been doing so with an eye towards creating professional learning communities, by encouraging educative mentoring practices (Feiman-Nemser, 1998), and facilitating ongoing critical examination of the professional communities new teachers enter. Feiman-Nemser and her colleagues wrote in 1999, “Few induction programs regard cultural transformation as a condition of their success” (p. 20). We do. A focus on beginning teacher induction is our means and professional learning communities are our goal. It is not possible to work towards a goal without clarity about what it entails. Therefore it is worth pausing to consider what defines a professional learning community. While definitions vary, central to most definitions is an emphasis on productive teacher talk: in a true professional learning community, teachers regularly discuss teaching and learning with the intention of improving their practice and reaching shared goals for student learning. Some of the practices identified with professional learning communities include co-planning, peer observation and discussion of teaching, and looking at student work. A shared vision of the schools mission (e.g. Jewish, academic, civic) and a clear articulation of what good teaching looks like in the school. A shared understanding that teaching is complex intellectual work and learning to teach well takes time, collaboration, and on-going professional development. A shared commitment that the school should provide for the serious learning of faculty and students alike, and that faculty members should take collective responsibility for the development of their colleagues and students. These shared understandings are not present in most schools, nor are they reflected in society. Most schools have mission statements, yet few faculties truly use them as a guide or connect them to shared standards for teaching practice. Articulating a clear vision of what good teaching looks like counters strong cultural norms of individualism and privacy among day school faculties, which reinforce an image of teachers as lone artisans, following their passions behind closed doors. The idea that teaching is intellectual work contradicts wider societal beliefs about who goes into teaching and what the practice of teaching entails; and the notion that all teachers need ongoing professional development counters the assumption that teachers who graduate from pre-service education programs are highly qualified with all of the skills and knowledge they need. Because these understandings do not appear naturally in a school, they must be carefully cultivated. Without them, collaborative practices such as mentoring and looking at student work fall flat, and teacher talk about instruction is unlikely to lead to real learning. But how do you cultivate something as nebulous as a shared vision, belief or commitment, particularly when everyone is distracted by the day-to-day challenges of running a school? This is very difficult, and likely one of the reasons that school leaders and policy makers so often begin with creating structures (like assigning mentors or scheduling sessions to analyze student work). It is much easier than creating culture (like instantiating the belief that teachers should be collectively responsible for their colleagues professional learning). We know that administrators cannot mandate beliefs. Ultimately, teachers must see a good reason to embrace the shared understandings that allow for the creation of true professional learning communities. One way to get them there is through an intensive focus on induction, which puts experienced teachers in the role of school- based teacher educator and opens sustained, facilitated conversations about how to develop the practice of beginners. This gives experienced teachers an authentic reason to discuss teaching and learning, and at least initially a safe focus that is outside of their own practice. As experienced teacher-leaders guide novices, both may experience a mini-apprenticeship in serious professional talk, developing a common language about instruction and skills for collaboration. They may then take that language and those collaborative skills into the greater school community. Betty Achinstein, of the New Teacher Center, writes, “Teacher leaders in induction are strategically situated to have a ‘ripple effect’ ”, impacting both classroom practice and school culture (2001, p. 50). Below are some examples of how such cultural transformation can begin to take hold, drawn from our experiences in the Induction Partnership. A strong system of induction begins with an inclusive, information-rich hiring process (Liu and Johnson, 2006) in which candidates learn enough about the school community, and school leaders learn enough about the candidate, to ensure a proper fit. As our induction coaches examine school-level hiring practices with partnering administrators, conversations about the mission of the school, and how best to communicate it to potential applicants, naturally arise. Including faculty and parents in hiring, as best practices in induction suggest (ibid), means also including them in articulating what the school stands for and hopes to achieve. By engaging questions such as these, the schools in our partnership are working towards a clearer articulation of their Jewish missions, learning goals for students, and attendant instructional goals for teachers. If we are to foster beginning teachers success, it must be clear what “success” looks like. This can be surprisingly murky. Early in our induction partnership, we interviewed beginning teachers about their experiences during the first few months of school. As part of the interview, we asked them what their formal evaluations would be based on. Some beginning teachers did not know. Several others said that their evaluation would surely be based on parent satisfaction. The rest offered ideas ranging from how caring they were towards students to how well they understood the content they were teaching. Coaches shared the beginning teachers perceptions with administrators, urging them to clarify and communicate the standards for teacher evaluation. This is not a straightforward task and the coaches request prompted a good deal of thinking and discussion among school leaders and experienced faculty about what good teaching looks like, how to recognize it, and how to support novices in growing towards it. Several partner schools have since reconsidered their evaluation processes and increased the frequency with which administrators and other support staff communicate with beginning teachers about their practice. One partner school has formed a committee of teachers and administrators to draft school-specific standards for instruction. These small steps represent progress in developing a shared understanding of what good teaching looks like in a given schools, something we believe is essential to the formation of true professional learning communities. An induction coach noted that when she began working with her partner school, simply introducing the idea that beginning teachers need different kinds of supervision and support than their experienced counterparts was powerful. It opened new conversations among administrators and faculty about how teachers practice develops over the span of a career and what teachers at different career stages need to learn (Feiman-Nemser, 2001). Making time for these conversations, and allowing teachers and administrators to acknowledge publicly that it takes time to develop the understandings and skills necessary for effective teaching, became a foundational step of the induction program at that school. The acknowledgment has in turn led to some policy changes: for example, administrators have assigned mentors to second year teachers, recognizing that they are still learning to teach, and have begun to stand up to complaining parents, demanding that they be patient as novice teachers find their way. Conversations among teachers and school leaders continued as the coach encouraged the school to adopt a model of beginning teacher mentoring, and our team provided training for the experienced teachers selected to be mentors. The mentor training opened a series of important questions: What are we supporting teachers to know and be able to do? When a mentor observes a beginner, what should he or she be looking for? When a beginning teacher observes a mentor, what practices should the mentor model? What does good teaching look like at our school, and how do teachers grow into it over time? In the second year of our partnership, mentors at three of our schools have initiated study groups, rounds, and looking at student work in order to deepen their own understandings of instructional practice. They have invited novices to participate in these activities; in one school a beginning teacher hosted a recent session of rounds, inviting experienced and novice colleagues to study an aspect of her teaching and give her feedback. Mentors in our partner schools have urged administrators to give teachers time to collaborate and professional development to foster the necessary skills for productive collaboration. These changes, initiated by teacher-leaders rather than mandated by administrators, reflect the development of a shared understanding that teaching is complex work, and learning to do it well takes time, collaboration and on-going professional development. In one of our partner schools, teams of teachers have shared classrooms for years, but administrators observed that those teachers rarely co-taught, co-planned, or debriefed lessons. The induction coach found that assigning experienced teammates “official” roles as mentors to the novices on the team gave them newfound permission to talk about teaching and learning with their mentees. It also opened a school-wide discussion about the purposes and potential benefits of teaming. School leaders asked that mentors and mentees observe one another regularly, thereby legitimizing a practice from which teachers previously had shied away: watching and discussing one another’s practice. This is not to say that assigning new roles and requiring regular observations gave the teachers necessary skills for deep and candid discussion of practice; those collaborative practices are still developing. However the permission alone was important. Making the mentoring role official and the expectation of regular observations explicit helped promote the idea that teachers are responsible for one another’s growth, and that schools should provide for their serious learning. As pairs of teachers in the school gain comfort in talking about teaching, our coach anticipates Achinstein’s “ripple effect” in the greater school community. In the second year of the partnership, each school has developed a cadre of mentors who share responsibility for the support and development of new teachers. Mentors meet regularly to discuss their practice and learn strategies for developing their mentees skills. Two schools have appointed an experienced teacher to serve as the official leader of beginning teacher induction, responsible for such activities as coordinating mentoring, participating in hiring, facilitating new teacher orientation, and organizing teacher study groups. Coaches have observed that the mentors, in discussing how best to support novices, often grapple with school-wide issues related to professional learning. For example, in discussing how to help novices determine what to teach, mentors review the adequacy of available curricula. In discussing how to support novices in learning how to teach certain concepts and skills to students, mentors review the current structure of formal professional development, and share their feedback with administrators. This did not happen overnight. It has required a substantial investment of time and energy on the part of coaches, school leaders, and mentors. It has also required a deliberate effort on the part of coaches to connect the induction activities to the shared understandings that animate professional learning communities. Coaches are not just creating structures, they are brokering ideas. As we continue to work towards the goal of fostering professional learning communities, we are beginning to see evidence of the shared understandings, some more clearly than others, and all at different levels of development across the four partner schools. As the second and final year of coaching ends, we are contemplating how to help partner schools sustain and extend the growth they have already made in becoming true professional learning communities, 21st century day schools in which all teachers (and their students) can thrive. Achinstein, B. (2001). Building a community of learners and leaders for transformational induction programs. The New Teacher Center at Santa Cruz. Draft copy dated 4/7/01 available at www.newteachercenter.org. Breaux, A.L. and Wong H.K. (2003). New teacher induction: How to train, support and retain new teachers. Mountain View, CA. Harry K. Wong Publications. Feiman-Nemser, S. (2001). From preparation to practice: Designing a continuum to strengthen and sustain teaching. Teachers College Record, Vol. 103(6), 1013-1055. Feiman-Nemser, S. (1998). Teachers as teacher educators. European Journal of Teacher Education, 21 (1), pp. 63-74. Feiman Nemser, S., Schwille, S., Carver, C. and Yusko, B. (1999). A conceptual review of the literature on new teacher induction. Washington, DC: Office of Educational Research and Improvement. Fulton, K., Yoon, I. and Lee, C. (2005). Induction into learning communities. Prepared for the National Commission on Teaching and Americas Future, Washington, DC, August, 2005. Available at www.nctaf.org. Johnson, S.M. and the Project on the Next Generation of Teachers (2004). Finders and keepers: Helping new teachers survive and thrive in our schools. San Francisco: Jossey Bass. Kardos, S.M., Johnson, S.M., Kauffman, D.C., Peske, H.G., and Liu, E.P. (2001). Counting on colleagues: New teachers encounter the professional cultures of their schools, Educational Administration Quarterly, 37(2), pp. 250-290. Lieberman, A. (1996). Practices that support teacher development. In M.W. McLaughlin and I. Oberman (eds) Teacher learning: New policies, new practices, pp. 185-201. New York: Teachers College Press. Little, J.W. (1999). Organizing schools for teacher learning. In L.D. Hammond and G. Sykes (eds) Teaching as the learning profession: Handbook of policy and practice. San Francisco: Jossey-Bass. Lui, E. and Johnson, S.M. (2006). New teachers experiences of hiring: Late, rushed and information-poor, Educational Administration Quarterly, 42(3), pp. 324-360. Meier, D. (1992) Reinventing teaching. Teachers College Record, 93 (4), 494-509. Moir, E. (2003). Launching the next generation of teachers through quality induction. A paper presented at the NCTAF State Partners Symposium, Santa Cruz, California, July, 2003.